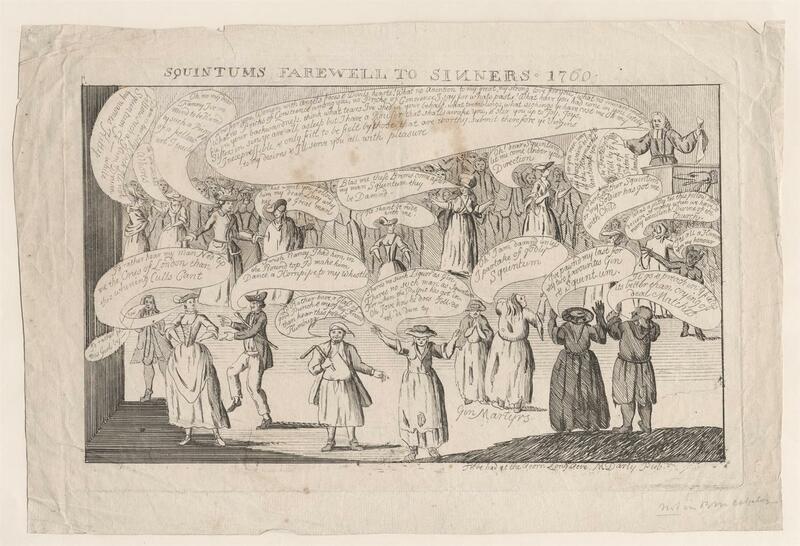 Squintums Farewell to Sinners, M. Darly, 1760, Yale University. Darly's caricature shows the reaction of a diverse crowd to the sermonizing of Squintums, a stand in for the famous preacher George Whitefield. Notorious for their supposed irreligious nature, it was appropriate for Darly to include a sailor in his representation. The unnamed tar speaks to an attractive lass, "I wish Nancy I had him in the Round top Id make him Dance a Hornpipe to my whistle." The sailor himself is dancing as he speaks, with the trusty stick tucked under his left arm. A cocked hat with a cockade on the left side is fixed atop his bob wig. Around his neck is a neckcloth or cravat tucked into his shirt, and he is without a waistcoat. The jacket has slit cuffs and runs down to the top of the thigh. His trousers are plain and end at the bottom of the calf.